The Glass Door Lock are suitable for 1/4 inch or 3/8 inch (6 or 10 millimeter) thick glass. Tightening is done by means of two plastic tipped screws. The key can be removed in the locked position only. 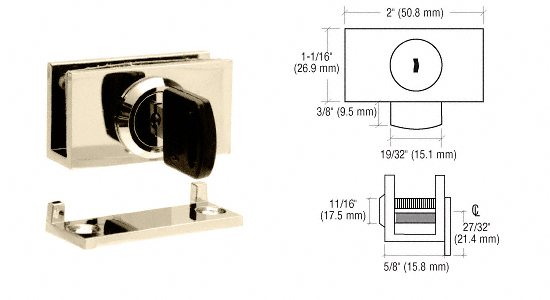 The Glass Door Lock are suitable for 1/4 inch or 3/8 inch (6 or 10 millimeter) thick glass. Tightening is done by means of two plastic tipped screws. The key can be removed in the locked position only. Lock is supplied with gaskets and template. A matching Stop Plate is included to match the finish of the lock of choice. A cut-out in the glass door is required for installation and a notch template is included in the package.